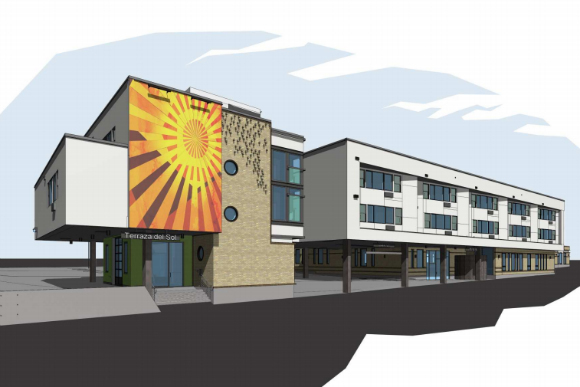 A rendering of Mi Casa Resource Center's new HQ in Westwood. The projects discussed at the Nov. 17 event in the conversation ranged from a new home for the nonprofit Mi Casa Resource Center to Catalyst Health-Tech Innovation (HTI), a campus focused on advanced healthcare technologies. While each project represented different needs and end users, they all shared common themes: inclusion, being purpose-built and seeking input from their communities. Beyond Mi Casa and Catalyst, David Zucker, principal of Zocalo Community Development, and Doug Price, CEO of Rocky Mountain PBS, were both on hand to discuss RMPBS' new home in downtown Denver, and Mark Shaker of Flightline Ventures was on hand to discuss The Stanley Marketplace. Christine Marquez-Hudson, executive director of Mi Casa (and soon-to-be president and CEO of The Denver Foundation), moderated the panel and discussed the Mi Casa project, which will blend low-income housing and social services. Also on hand was Carl Koelbel of Koelbel and Company, which is developing Catalyst HTI. Please click here to read the full article and to view photos and project renderings from the event.